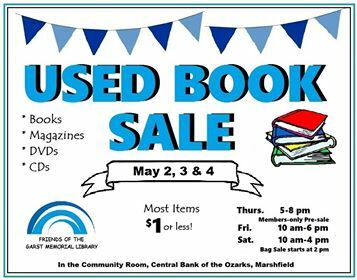 The Friends of the Garst Memorial Library invite you to their Used Book Sale May 2 - 4, 2019 in the Central Bank of the Ozarks Marshfield Community Room. The sale will kick off on Thursday, May 2nd with a FGML Member Only Sale (memberships can be purchased at the door for $5) from 5-8 pm. The general public can then attend the sale on Friday, May 3rd from 10 am - 6 pm and Saturday, May 4th from 10 am - 4 pm. Most items under $1!